Today, the concept of whole house surge protection or whole home surge protection is becoming more and more popular. One of the important reasons is that today there are too many electronic devices that are very expensive yet very vulnerable to power surges. It is estimated that an average house contains more than USD 15000 electronic and electrical products that are unprotected from surges. A typical surge attack may leave all the electronic and electric devices paralyzed and that’s the case you never want to experience. So in this article, we are going to talk about this subject: whole house surge protection. Why we need whole house surge protection? Surge is a very common danger to home appliances. If you live in a area with frequent lightning strikes, you may already suffer from the damages it brings. Here are the stories from two victims. Does it sound similar to you? July 2016 We experienced a power surge one week ago. Our oven (electronic board burned out). Our surround sound burned out also, as well as our Dish receiver. The transformers on the telephones, modem, and furnace burned out. Our air-conditioner would not come on because the furnace was out. Several florescent lights also burned out. I just recently had a surge. You could see it. The lights would oscillate between dim and normal. Some breakers would trip. This surge burned up a plug strip type surge protector which in turn, burned up the power supplys on my son’s Xbox one and Xbox 360. It did not affect his tv (his tv was not surge protected), wii-u, or Apple TV. Surge protection elsewhere did its job. I lost a control transformer on my furnace and my wi-if sprinkler timer. My wife’s wine chiller stopped working also. Let’s look at some pictures of surge damage. Actually, these are moderate damages. In some mission-critical section like oil & gas, railway system, surge can cause disasters. Yet there are some common misunderstandings about whole house surge protection. Misunderstanding 1: I live in an area with very low frequent lightning activity. I think the the possibility of my house hit by a lightning is close to zero. Thus, I don’t think my house need surge protection. Our advice is: don’t gamble on the bets. Though the chance of be hit by a direct lightning is indeed very low. The possibility of being attack by surge is far more higher than most people expected. For one thing, surge is only caused by direct lightning hit. 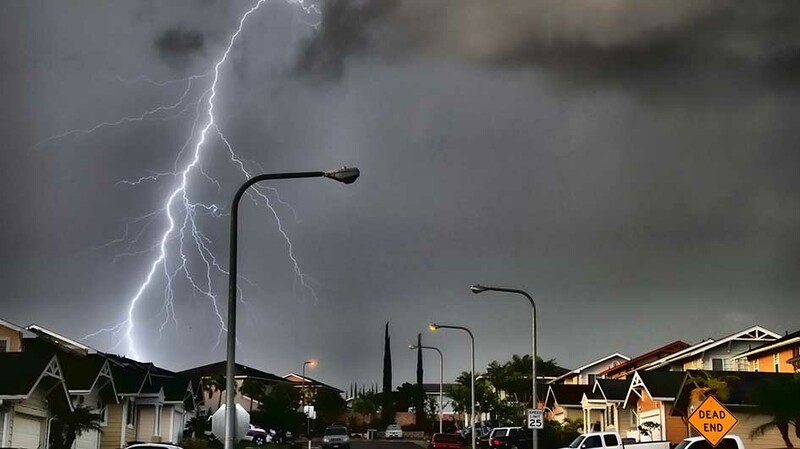 A nearby lightning hit can cause a very strong surge into your house too. Another important idea that are often overlooked is that, most surges are actually generated inside your house, for example, the on and off switch of a motor. These surges are frequent and with lower energy and they may not be able to destroy your home electronics at one time. But it degrades them over time and shorten their lifespan. Misunderstanding 2: I already have a power strip with surge protection function connected to my appliance. It is already safe enough. When we talk about surge protector, maybe most people only refer to a power strip or receptacle which look like this. Yet the problem with these surge strip or surge protector, whatever you call it, is that they either provide no protection or very low level protection to surges. When a strong surge attack, even the surge strip will be damaged and even burnt. In this case, they only give you a false sense of security. How to Set up a Safe & Sound Whole House Surge Protection? The answer is a multi layered or cascaded surge protection. You need to install a surge protection device (SPD) at your electric panel as the first line of defence for strong surges that may encounter. This surge protection device will shunt most of the surge to the ground and only leaving a very limited surge energy to downstream which can be handled by your surge strips or receptacle. What Surge Protection Device Should I Choose? Remember, when choose the surge protection device for your house, always look for the quality one. Low quality SPD, not only do they cannot offer safety to our house, they themselves are a very serious safety problem. We strongly suggest your read the below article which gives a thorough presentation of the safety problem of surge protection device. And also, you may surprise to learn how SPD can be a safety hazard at your home in low ABC News report. Here we recommend Prosurge’s PSE series surge protection device for your whole house surge protection system. It adopt our global patented technology which ensure the maximum safety in surge protection. For more information about our PSP E series whole house surge protection device, please visit this page to learn more. If you’ve set up your whole house surge protection system as instructed, congratulation！But still we would like to remind one thing: like any other electrical product, surge protection device has a infinite life span. It’s working status is indicated by the LED light. If the LED light turns red, it means the surge protective device has come to the end of its life. So in this case, you need to replace it with a new one as soon as possible otherwise you are leaving your house unprotected.